Bollywood knows the Art of seizing a trend and also making one. One of the reasons Bollywood has been in Spotlight for its Marketing Strategies is keeping themselves updated with the Technologies and Knowledge of the market. Gone are the days where people watched movies, getting attracted to a spellbound Title or by casting famous celebrities. 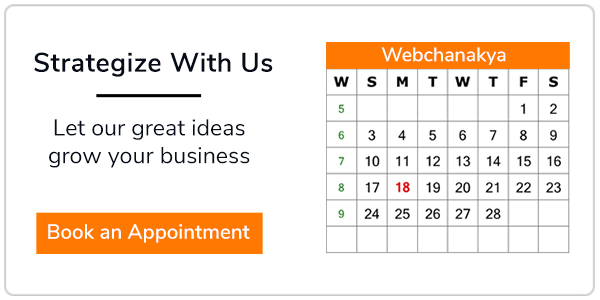 If maximum audience reach is your goal, you need to be smart enough to sell. We analysed some of the unique and well-planned Strategies that Bollywood Distributors applied which somehow influenced people and got their movies in the limelight. If there is any Recent film which had a successful marketing strategy, Sanju would be on top. The Film disclosed some pages from life journey of Bollywood Actor Sanjay Dutt on being a drug addict to his trails of accused with 1993 Mumbai Blasts. The movie entered in 100 crore club within just 3 days of its release and became the highest grossing film of 2018 in India. Film Director Rajkumar Hirani along with Film Distributors Fox Star Studios planned its marketing strategy in such a way that it created a buzz in viewer’s mind before the film release. The distributors released its teaser in between of IPL Season in month of April 2018 that was just 2 months before its release. It showcased different avatars of Sanjay Dutt played by Ranbir Kapoor with some brief situations of actor’s life. The Teaser turned out to be a massive hit and it got 30 million views within just 2 days. Before a Month of its release, Fox Star Studios posted Spin the Wheel Contest on its Official Facebook and Twitter accounts, in which participants were asked to log in and spin the wheel to get cash back offers. Few days before the release, where others were celebrating Father’s Day, Film makers grabbed this opportunity and posted a scene from the film with a reaffirm from Sanjay Dutt’s famous movie dialogue ‘Jadoo ki jhappi’ (The Hug of Magic) where a father and his son hug each other and share a happy moment. The post gained Popularity and ignited curiosity of viewers to watch the film with resulted in 1 lac conversation on YouTube on that day. 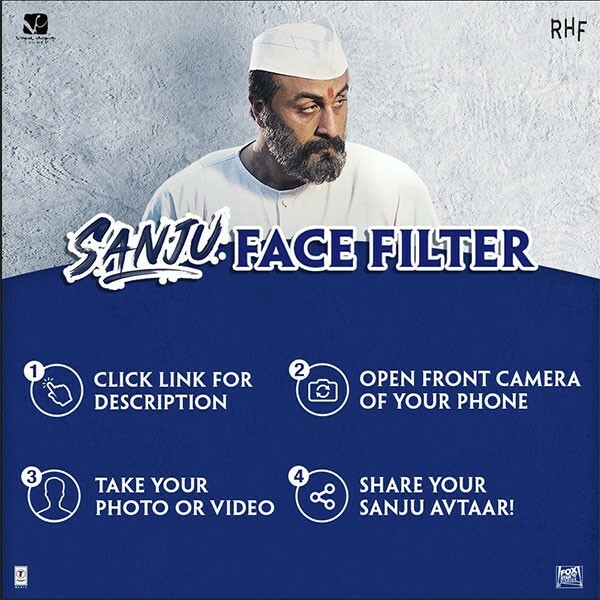 Observing the hot topic through conversations in social media about their film, The Distributors Launched Face Filter Partnership with Facebook where users were asked to click their photo with Sanju Avatar and share it. Nearly 5 Lac People used the filter and it became highest filter to be used in Facebook in India charts. Remember this movie which created a loud buzz on Twitter with its social media marketing strategy. 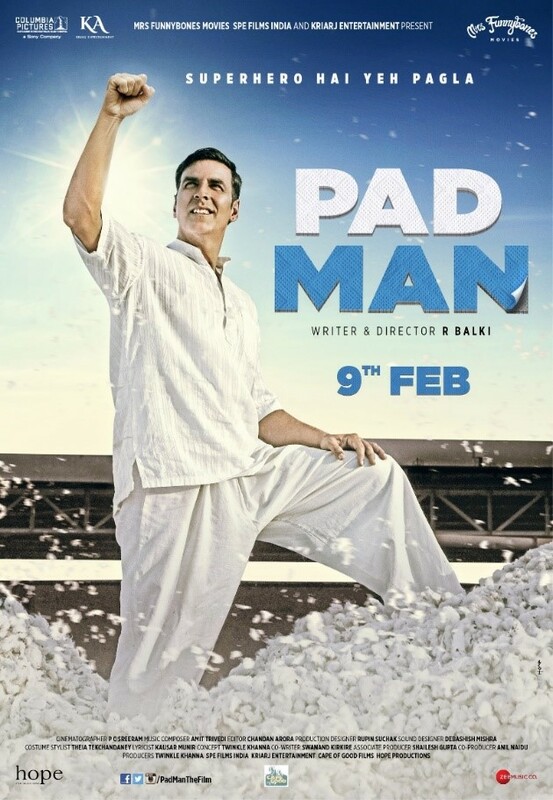 The movie, based on life of Mr. Arunachalam Muruganantham form Tamil Nadu, who created low cost sanitary napkin machine with a motive of menstrual hygiene in Rural areas of India. The movie also talks about the wrong beliefs and unhygienic practices among people in remote villages. Sony Pictures along with Director R. Balki smartly carried out the marketing campaign which created a sensation on social media sites. A week before the film release, Sony Pictures partnered with MissMalini.com and created a funny video featuring Akshay Kumar and Sonam Kapoor with title ‘If your Periods was a Person’. The funny content attracted many people and has 1.9 Million views till date. The following day they posted a video with Peepingmoon.com featuring Akshay Kumar and Aryana Johar with a Poetic Content about Menstruation in India. The makers then partnered with Bollywoodlife.com, famous blog site which writes about Bollywood Films, created an educational content staring actor Akshay kumar discussing wrong beliefs practised by Indian mothers when their daughters face days of Periods. It started with Mr. Arunachalam who himself posted this challenge on his official twitter account, nominating the cast of the film to post the same on their post. The Chain created a sensation among Twitter accounts when cast nominated other celebrities to take up their challenge and post the same. Actors like Aamir Khan, Varun Dhawan, Swara Bhaskar, Arjun Kapoor, Alia Bhatt, Anil Kapoor and others accepted this challenge in a enthusiast manner and promoted the movie to kill the Taboo. The Actor along with his wife Twinkle Khanna in a joint venture declared the Auction of cycle used in the film. The Fund raised through it were donated to NGO called Population First which worked for menstrual Hygiene. Though the Movie didn’t perform well as expected on Box Office, but the movie made its mark on charts of well-Planned marketing campaigns. When it comes to Promote movies, no one does as good as Shah Rukh Khan who is also known as king of Marketing in Bollywood. FAN movie talks about the obsession of some fans, keeping their star as their idol. The movie also throws light on life of superstars who cares about their image and difficulties they face when their image ruins. Few days after the first Teaser of the Film, the makers partnered with YepMe.com and announced a contest on twitter to take part in and 100 Lucky Participants can get a chance to get featured in Film’s Logo. Winners were selected and their photos were featured in the Film’s Logo as Announced earlier. Yash Raj Films took advantage of their reach and started a Video Campaign as ‘Tu nahi Samjhega’ with the life stories of Real-life fans who push their limits to encourage and support their Idol. They posted 5 Part video on their Official YouTube Channel consisting different real stories on Fans and their life. We all know the Jabra fan song. Original Song was sung in Hindi but later on the distributors selected 6 states and coordinated with famous singers for featuring the song in different regional languages. The Regional versions were published in Gujarati, Bhojpuri, Tamil, Punjabi, Bengali and Marathi and gained a huge popularity. Later Arabic Version of the song was also published. 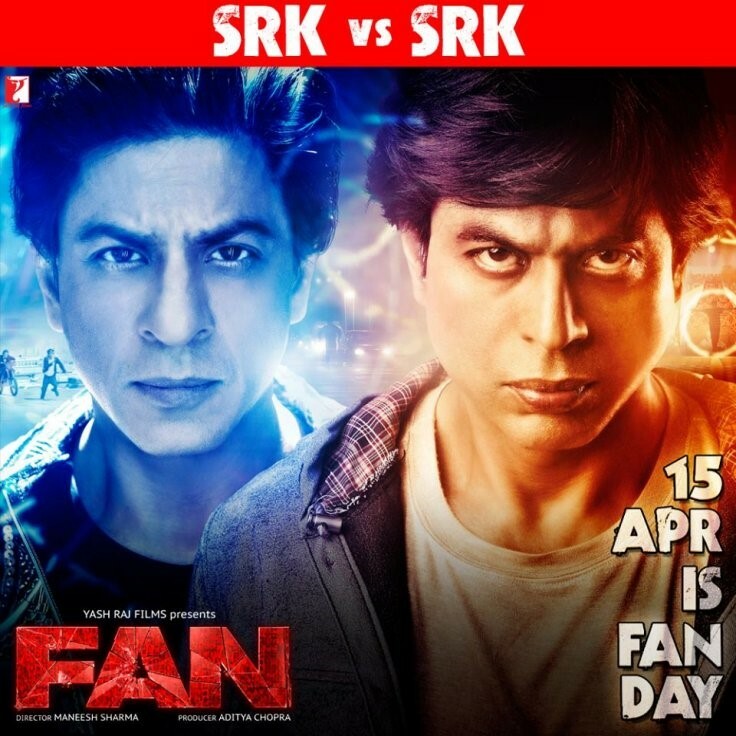 Welcoming the old trend of Sending letters to Superstars and using Fan crowd of SRK, The YRF team asked their Fans to write letters to their film Star. 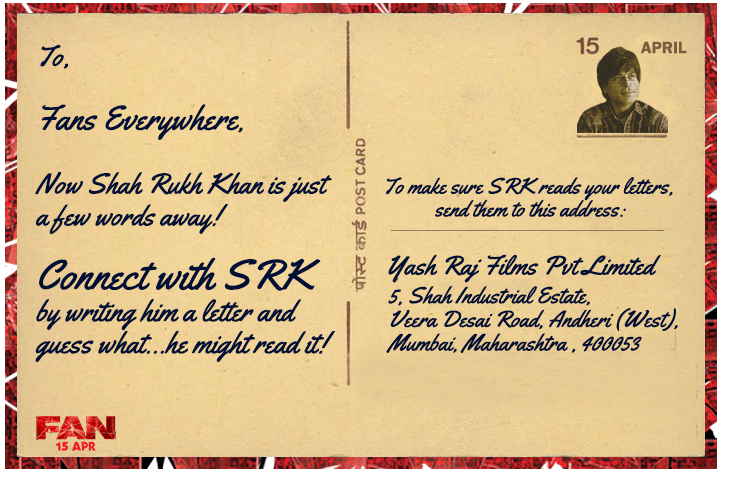 Fans can send their letters to YRF Office and later they also announced that Shah Rukh khan would be reading some letters himself. As promised selected letters were read by the Star which also included some Funny requests like asking to eat the cake without using his hands and Dancing on beats of a song. RA-ONE (2011) – The movie started its marketing campaign 200 days before the date of release with putting up 60% of their budget on Digital Marketing. Making Audience a part of production process by asking their decisions. ‘Jab We Met’ (2007) – In 2007, Makers of the movie announced Polling system for setting the name of Movie. Later, after getting maximum votes the name ‘Jab We Met’ was declared. 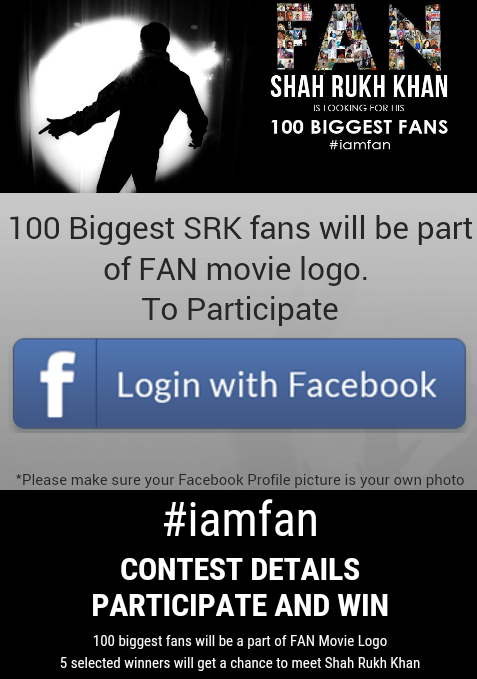 Nominating others for challenge with an element of upcoming movie. Distributors partnering with the Tickets booking Firms such as Bookmyshow, Paytm and others giving cashbacks and other offers. Partnering with Multiplexes and Cinema house with a unique concept of film promotion. 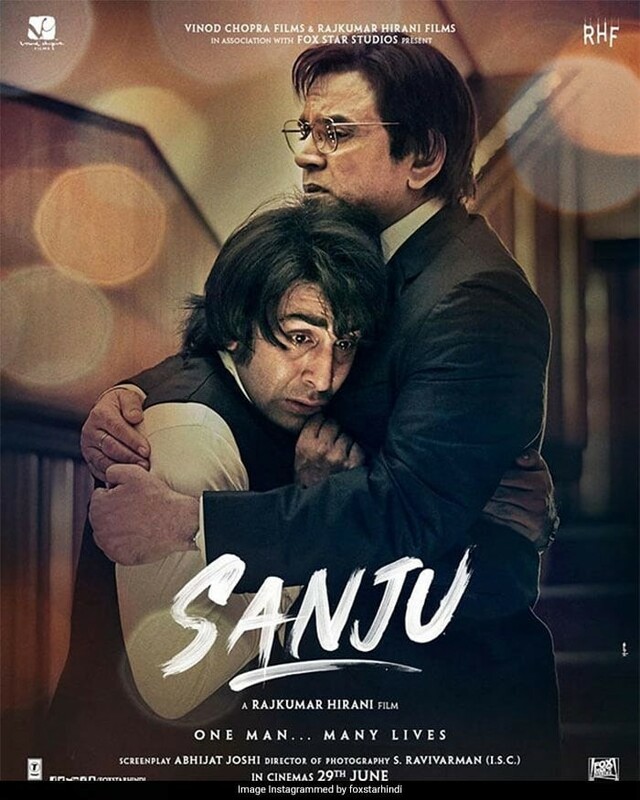 Sanju (2018)– Makers of Sanju partnered with INOX and their staff was seen wearing face mask of their movie characters. Updating Production Process in social media. Bahubali (2015) – Makers of Bahubali started its marketing campaigns way to earlier and regularly updated their fans with the movie process. Bollywood Cast would change their social media accounts name in order to spread their upcoming film. Setting trend on Social Media. Dilwale (2015) – During Promotion of Dilwale the cast promoted their movies taking Half-Faced selfies which after became trend on social media. Launching Animated series and Games. Baajirao-Mastani (2015) – Eros International promoted their movie Baajirao-Mastani by Launching 8-part Animated web series before 2.5 months of their movie release. Our audience is smart enough to choose the movie with their intellect so it becomes very important for filmmakers to give special attention to marketing to create the necessary buzz and hype. The movies listed above are considered on the basis of unique and result oriented marketing which we believe can influence the Robust Box Office Collections.